Supporters of the legendary International Brigades of the Spanish Civil War will gather in Jubilee Gardens in London’s South Bank from 12.30pm on Saturday 6 July. Next to the park’s International Brigade memorial they will commemorate the 2,500 volunteers from the British Isles who defended the Spanish Republic against Franco, Hitler and Mussolini between 1936-39. The 2013 ceremony coincides with the 75th anniversary of the start of the Battle of the Ebro in July 1938. This was the last great battle of the Spanish Civil War and has been described by historians as the first battle of the Second World War. More than 90 members of the British Battalion were killed during the battle. They were among 526 British and Irish volunteers who died in Spain during the civil war. Wreaths will be laid at the London memorial by, among others, representatives of the Catalan Delegation in London, Spanish exile and refugee groups and the Association of Jewish Ex-Servicemen and Women. Most of the fighting in the Battle of the Ebro took place in Catalonia, so this year’s commemoration will have a Catalan theme. 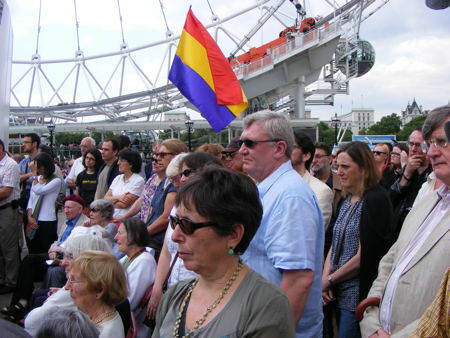 The London-based Catalans UK choir will sing Spanish Civil War songs and Jordi Palou-Loverdos, director of Memorial Democratic, the Catalan government’s Spanish Civil War remembrance agency, will say a few words. Proceedings will take place against the background of a threat to the memorial to the International Brigades that was unveiled in Madrid’s University City in 2011 with financial help from the IBMT. On 3 June this year the Madrid regional high court ordered the Complutense University to remove the memorial on technical planning grounds following a complaint brought by a lawyer with far right connections. Meanwhile on 27 July in Nottingham an information board about the International Brigades will be reinstated outside Nottinghamshire’s County Hall. The board was removed in 2009 after the Conservatives won that year’s county council elections. But Labour regained control in May this year and immediately announced that the board would be restored to its place in front of a plaque to the volunteers from Nottinghamshire that was unveiled in 1993 by Spanish ambassador Alberto Aza and Jack Jones, the former transport workers’ union leader who was injured in the Battle of the Ebro while in the International Brigades. The Spanish Civil War began in July 1936 when General Francisco Franco and other army officers launched a fascist-backed coup against the Spanish Republic. Franco’s rebels received overwhelming help from Nazi Germany and Fascist Italy in the form of troops, aircraft and armaments. Meanwhile, Britain and the other Western democracies enforced an arms embargo on the Spanish Republic, effectively condemning it to defeat. Franco declared victory on 1 April 1939. Only one British veteran of the International Brigades survives: Stan Hilton, a former merchant seaman from Newhaven, Sussex, who now lives in Yarrawonga, Australia.